Larissa Papenmeier proved her talent again in the second race of this year’s Women’s Motocross World Championship in Agueda, Portugal and raced to second place overall this weekend. A week after her victory at the opening race in Italy, the 28-year-old German rider on the Team Twenty Suspension Suzuki RM-Z250 rider started the second round as the overall leader with the red plate. Changing weather conditions caused difficult track conditions. But Papenmeier impressed with fast lap-times in practice and qualifying runs which led to third position on starting grid for Saturday’s races. Due to her good reaction, Papenmeier had a good start. Caused by the loose ground with deep ruts, there were hardly any overtaking inside the leading group; and that’s why Papenmeier had to be content with third position. The second’s race start went perfectly and Papenmeier led the race after her holeshot until lap five. While she had to let Courtney Duncan pass, she was able to finish in second position without any problems. 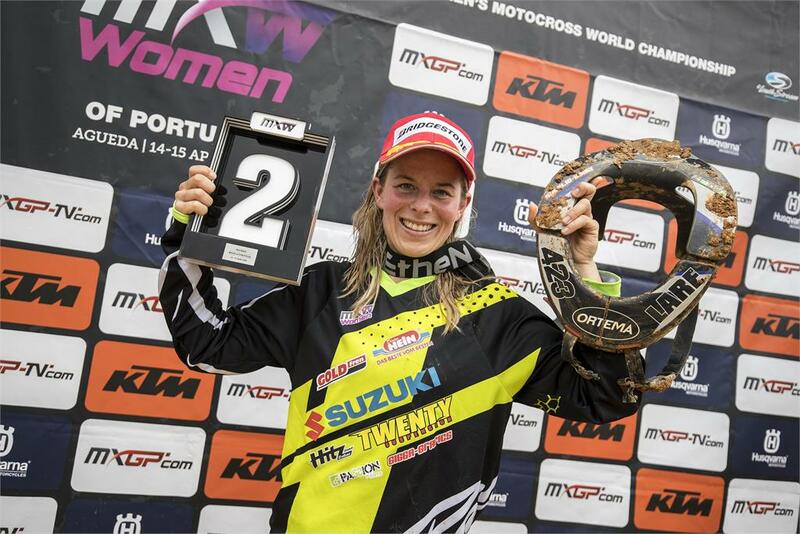 Anne Borchers (Team stielergruppe.mx Johannes Bikes Suzuki) delivered good results in Portugal. After a good start the 26-year-old had some troubles which had cost some positions, but she was able to fight back to eighth position. Her start in the second race was good and Borchers finished in sixth position for seventh position in the World Championship rankings. In the European Championship EMX250, Jett Lawrence (Team Suzuki Germany) started his second race of 2018 season. The 14-year-old is going to start in ADAC MX Youngster Cup and uses some EMX250 races to prepare for the German Junior series. Lawrence is one of the youngest starters between the fast riders of the European Championship but delivered a good performance in Portugal. After a bad start in the first moto, the young Australian lost some positions but found his way through the field again, so he finished 26th. In the second race he was able to proof his talent. Finishing the first lap in 22nd, Lawrence overtook one opponent after another and reached the finish line in 11. The next race of Women’s Motocross World Championship is on May 19th- 20th in Teutschenthal, Germany. ADAC MX Youngster Cup begins on April 21st- 22nd in Fürstlich Drehna.